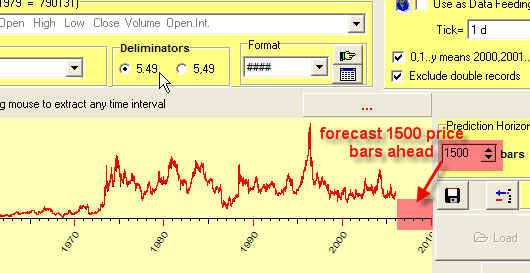 Thus we inform the program that we would like to make the forecast for corn prices for 1500 price bars ahead. 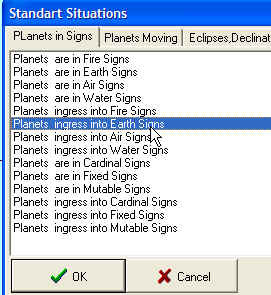 It definitely shows that the price goes up more than one week before the Sun ingresses the Earth signs. If we would do that, this strategy would give us 110 winning trades against 61 losses. Not too bad, but let's try to improve these results. We buy corn 10 days before the Sun ingresses the Earth sign and sell it exactly at that day. This strategy promises 68% winning trades. 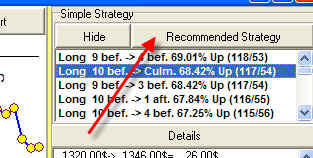 I called this model "a simple strategy" because it cannot be considered as a trading system. 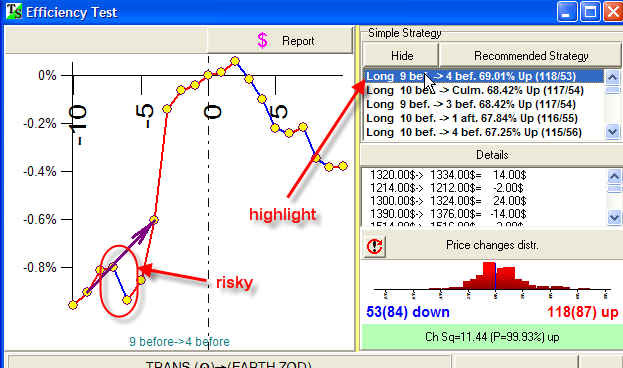 This strategy provides trading signals only once in 3 months. Any other time you cannot do trades. 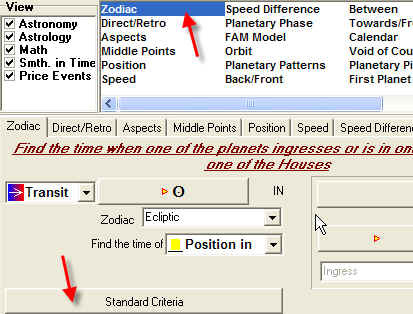 So, the model based on only one astronomical factor has no practical sense. In reality, we have to consider hundreds of these single factors. However, you can memorize this info and use it when the time is appropriate. 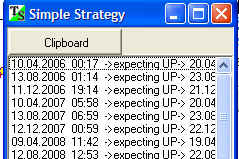 Do the next step - keep this info in your trading calendar. 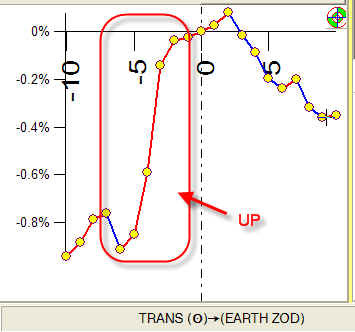 This is the power of astro trading: if you know (or find out) the single factors that are working for your financial instrument, you know days, months and years ahead when they will occur. 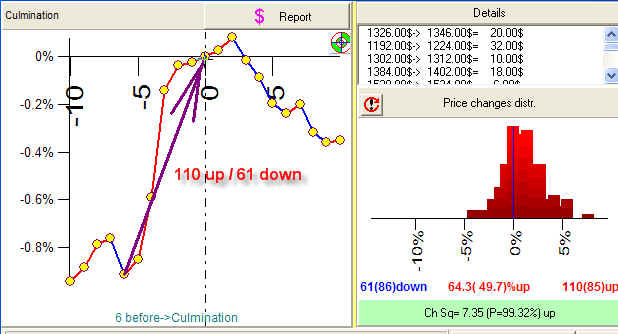 The red stripes correspond to upward price movements, the blue ones indicate downs (with the strategy "buy 10 days before -> sell when ingress"). Thus we can see how winning and losing signals are distributed in time, how they are balanced. If you prefer long positions, you would like to see here more red stripes. If you do short trades, you would like to see here more blue stripes. 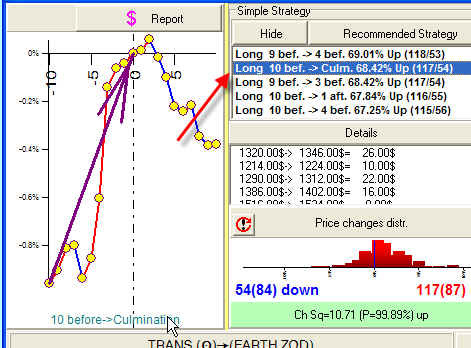 In the year 2001 and the beginning of the year 2002, this strategy would provide us 4 losing signals in row, i.e. the price went down. These stripes allow us to see the periods when the old market pattern does not work and the new tendencies appear.